Salena Lettera is one of the preeminent bloggers in the trucking industry. Her blog, The Daily Rant, has been a staple for readers following Lettera as she chronicles her life on the road and out of the cab. Lettera holds the distinction of having the longest-running daily trucking blog written by a woman, and is easily one of the most important figures in the realm of woman truckers. Along with her boyfriend, Ed Godfrey, Salena has made runs all around the country and shared her experiences with the world. The Daily Rant is a fun, personal, and honest blog concerning the trucking lifestyle as well as the life one inhabits outside of their work. Lettera is as much an accomplished writer and photographer (See her Flickr page here) as she is an accomplished trucker. Truck Driving Jobs got the incredible opportunity to speak to Lettera about her work and creative process, and how she manages an online presence while maintaining a career in what may sometimes be an unforgiving industry. TDJ: What inspired you to turn to blogging as an outlet for documenting your life on and off the road? SL: When I first went on the road in November 2004, my friends and family wanted to know where I was and what I was doing, so I created a “newsletter” in the form of a Word Document.I regularly emailed it to everyone who was interested. I called it The Daily Rant, mostly because I was “ranting” about things on the road, including pictures and stories about where we’d been and what I was seeing. Then, in early 2005, I discovered Blogger and decided to create my own blog.Instead of sending out newsletters, I directed everyone to my new blog instead.What started as a way of sharing my new life with those closest to me turned into sharing my new lifestyle with the world. When I started getting emails and comments from people across the globe, I was amazed. Now when I see far flung places showing up in my stats, I’m pleased that people around the world are still reading! TDJ: There are a rising number of trucking blogs out there, but you’ve made your blog distinctive with some incredible photography of the road itself as well as some of the places you visit on your routes. Had you always planned to do some sort of photo documentation to accompany the blog? SL: I didn’t really have a plan for the photography part, I just wanted to document what I was doing and share it with people close to me. Prior to starting my blog, my best friend and I developed an interest in taking pictures and some of those photos wound up on the blog to illustrate the blog posts I was writing. As my photography skill improved, I started using more pictures. Now I try to include as many photos as I can. I enjoy reading blogs that include photos in posts, especially travel blogs, so I thought people might enjoy seeing some of the places I was seeing in my daily travels. If what my readers say is true, it turns out I was right! TDJ: Where do you find time to write? Are you posting often from your sleeper? Do you prefer to write when you’re home in order to collect your thoughts or do you like the idea of blogging while still in the atmosphere of driving? SL: I make time to write whenever and wherever I can.I always blog on my computer, not my iPhone or iPad like some people do.I’m more comfortable sitting at the keyboard and writing. Sometimes the blog posts are swirling around in my head while I’m driving and I type them out when I get a chance, sometimes I have ideas I think will make a good post and I take down little reminder notes to myself, and sometimes things just come to me when I sit down in front of the computer. It’s a lot easier to have things to write about when we’re traveling to a lot of different places or sightseeing when we’ve got some extended down time. Since I like to write on the computer, and not my iPhone or iPad, I’m either in the sleeper sitting at the table, or on my laptop up in the cab while Ed is driving. When we’re busy, or doing a lot of team driving - which means sleeping/eating/driving with little time for anything else – I will catch up when I get home.I try to stay current, but sometimes I’m a few days behind and wind up publishing several posts at once. TDJ: How do you keep yourself motivated to update and write so continuously? SL: It’s like playing golf – a personal challenge.Since I have a blog titled The Daily Rant, I feel the need to keep up the daily part. Some days I curse the moment I chose that name, because often I feel pressed to create content, or I have writer’s block and can’t think of a thing to say! Ultimately, though, I enjoy it and I know people are reading.I don’t get a lot of comments on the blog posts themselves, but I do get emails on occasion and I can see how much traffic my site gets, so I know the readers are out there! When I’m home, like I am now on this local run we’re doing, it becomes a little more difficult to keep up with the daily posts because I do less exploring and there’s not much excitement. I’m trying to shift my blog focus a little bit right now by doing more photos or link posts because we’re not doing any cross-country trucking at the moment. TDJ: In addition to your own blog, you’ve written for magazines like The Long Haul and Highway Health. 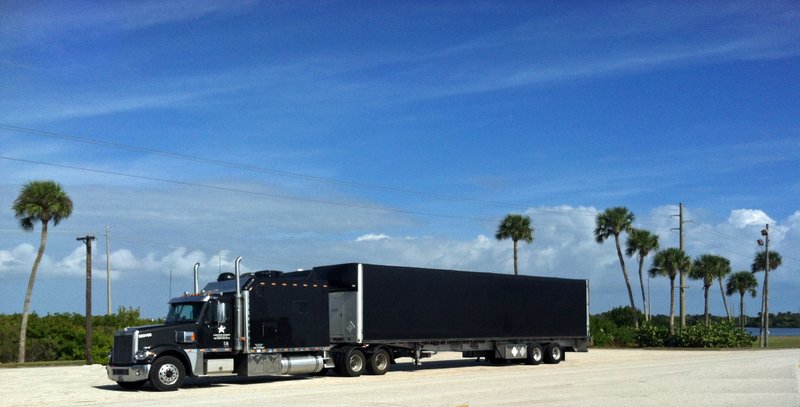 Do you consider yourself somewhat of an expert in the fields of trucker health and financial matters? SL: I don’t consider myself an expert in any field, but I do have over 10 years of experience doing this job so I feel as if I can impart some wisdom and offer some advice. I am not a health advocate by any means – you’d have to use brute force to pry a chocolate croissant from my hand - but I was raised on food cooked from scratch and cook for myself and Ed the same way I learned growing up. We eat very well in the truck when I cook, but we do hit the fast food places more than we probably should when we’re pressed for time. I do think it’s possible to eat better on the road by making and effort to make better choices, but that’s easier said than done. As for financial matters, that’s Ed’s specialty. I’ve learned a lot from him in regard to the financial side of the trucking business. Watching what Ed has done and asking him a lot of questions has increased my knowledge and allowed me to write about how to manage money, how to make the best choices when spending money on your truck and for your business, and even how to make a profit in an industry that tries very hard to keep a driver from doing so. Without Ed’s guidance and input, I wouldn’t have been able to write those pieces. TDJ: There are many drivers on teams face some difficulties with their partner - how do you and your boyfriend, Ed, make team driving work? SL: Surprisingly, Ed and I get along quite well.We’re polar opposites – I’m a New Yorker, he’s a Texan – so I’m not really sure how it works, but it does. We do share a small space on a daily basis, so there are disagreements and sometimes all out arguments, but ultimately we come back to a place where we’re both comfortable. People always ask what it’s like being together so much, all of the time.I tell them to sit in a walk-in-closet for three days with their significant other. That’s what it’s like. We eat, sleep, shower, read, talk on the phone, and watch TV within three feet of each other more than 300 days a year. I always give Ed the credit for this arrangement working. He’s easygoing and has a very even temperament and is really the one who deserves the credit for making living in small quarters bearable. TDJ: There’s a growing movement for advocating and endorsing women in trucking. Have you seen any growth in this direction or received any positive feedback in taking part in the movement? SL: When I was in trucking school, my teacher, who had over 40 years in the field, said women made better drivers than men.I don’t know of any studies that prove that, but all the women drivers I know are very serious, very conscientious, and very good at what they do. The American Trucking Association shows women entering the industry in record numbers but they still only make up 5.8% of the industry. That percentage has increased from when I started driving and I do tend to notice more women on the road.I have also seen an increase in women actually being recognized and singled out in the industry. Since I started driving, I’ve seen organizations for women drivers formed, companies seeking women’s advice on everything from interior cab design to product availability at truck stops, and even a trucking “beauty contest” for women drivers (although I’m not sure that was the best idea that’s come down the pike.) I think it’s a great field for women, but I don’t think many consider it as a career or even something they’re physically be able to do. Women think they can’t drive a vehicle as big as a semi, but whenever I’m asked, I always tell them it’s just like driving a big car.It really is that easy.It’s also empowering, satisfying, and an exciting way to make a good living. More women should give it a try! 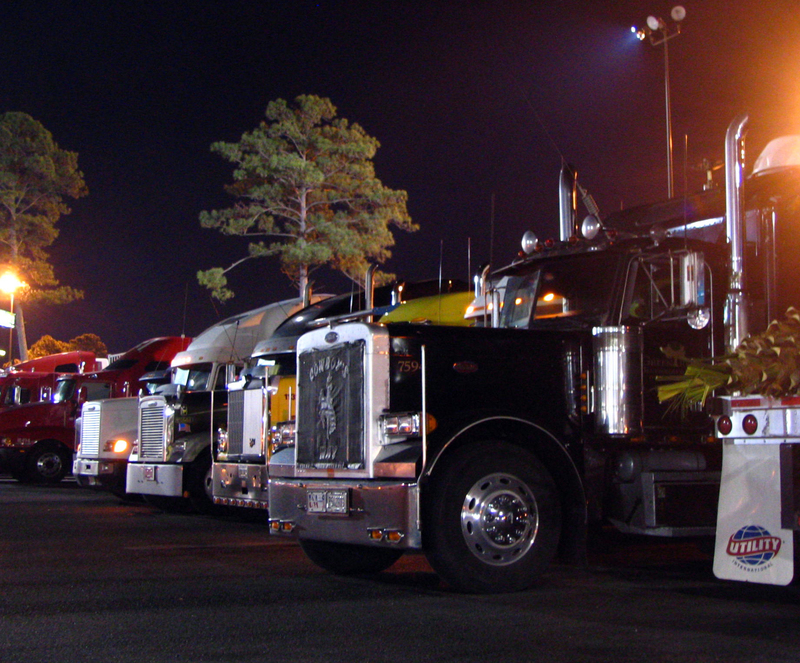 TDJ: What do you think is one of the biggest challenges we are currently facing in the trucking industry? SL: Lack of driver training is a big problem. From the most important aspect of safety, to some of the less important elements like trucking etiquette, drivers are often not educated about the industry they’re entering.In my opinion, this lack of preparedness starts during the trucking school training period. New drivers don’t get what they need, and don’t seek out the information once on the road.This is a serious job that comes with a lot of responsibility. You’re responsible for the safety of yourself and others around you and you need to be very aware of how your actions can affect others. New drivers don’t have insight to some of the simpler things - like how to navigate a truck stop (no speeding through the parking lot) how long they should linger on the fuel island, or common courtesy toward other drivers and the motoring public – and they don’t fully understand some of the more important things like regulations or how to work with and among other drivers. They’re not held to any standards.And many come out here without the tools they need to be successful.I’d like to see the training periods extended, I’d like to see true veteran drivers (ones with 30 years’ experience, not one year of experience) training the new drivers out on the road, and I’d like to see continuous education for drivers – required classes during their first years on the road. Experience and skill level should count for something and should be recognized in some manner. TDJ: What advice might you impart on someone who is considering a career in trucking? SL: Do a lot of research.Talk to drivers.Research the companies you’re thinking of working for.Have a little bit of savings before you start to get you through any mishaps.And if you’re going to become an owner-operator, learn as much as you can about operating costs, regulations, basic maintenance, load securing, etc. Use the internet and interview drivers in truck stops to find out which schools are good, which companies are good, where people are having trouble.There’s a lot of information you can obtain before getting out on the road. Find a mentor if you can. Don’t be afraid to talk to old-timers.Write to bloggers in the industry and ask questions.Do your homework.It’s a great career and offers a good opportunity to make money. And in my opinion, it’s fun! For more about Salena, be sure to check out The Daily Rant. Find her Facebook page, Instagram Page and Twitter for more updates.